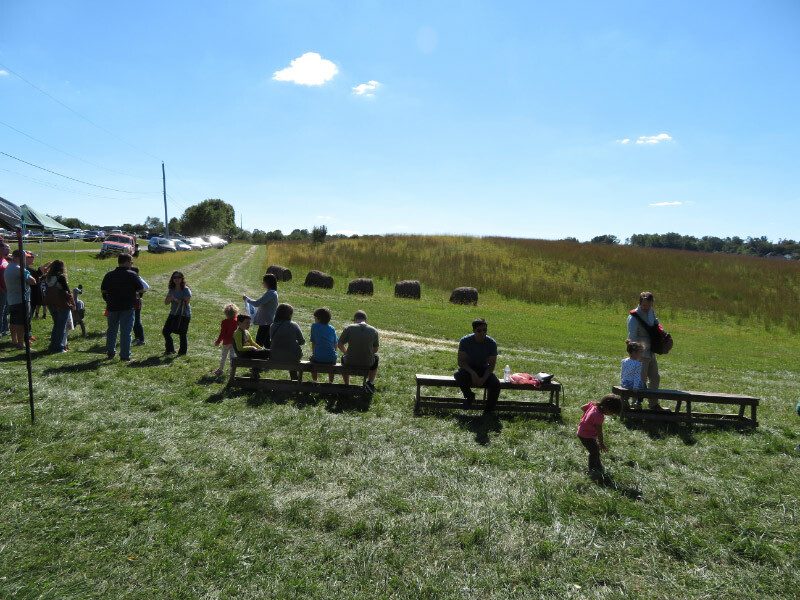 Last Saturday was Howard County Conservancy’s annual Fall Fest. I volunteered for the whole day. I went early since my first assignment was an activity new to the festival. It was good to be there when it was still relatively calm with just the vendors, volunteers, and staff getting ready – because the event was very well attended; toward the end of the day, one of the staffers said there had been about 1,500 cars (so double or triple that for numbers of people!). I know that both activities I helped with were busy the entire time. The first segment was inside the Nature Center and was a giant map of Maryland provided by National Geographic that took up most of the floor. There were activities that came with the map designed for grades 3-4 classrooms…so I modified them for a walkup audience and varying ages of children. The first requirement was ‘socks only’ – what child doesn’t like taking off their shoes! Even some of the parents joined in. The ages skewed younger so I encouraged them the ‘walk the Potomac River’ either from western Maryland down to the Chesapeake Bay or from the Chesapeake Bay to the west. Almost everyone wanted to find where they lived on the map….I added to that by asking how they would get from their house to the beach and they had great fun finding the Bay Bridge and then Ocean City or the Delaware beaches. Many of the parents helped their children find where various family members lived. Some children walked the Appalachian Trail (an orange dashed line on the map. Others plopped themselves down on the map along a state boundary. Toddlers holding onto a grandparent or parent walked across the map – often standing in the ‘blue.’ Many people noticed that the highest point of Maryland was in the far west of the state…and the big bays: Chesapeake and Delaware. I took a short break to sit down and eat a sandwich…then I was off to pumpkin painting. The activity was done on two paper covered picnic tables under an awning beside the farm stand selling small pumpkins. 8-10 children could be painting at the same time. The tables were set up with cups of paint and brushes…and my job was too try to keep the brushes in one color and the cups supplied with paint….wipe up the splatters on the paper when they got too thick. The original idea was to replace the paper during the day be there was never a slow time so the wiping kept them from getting too messy. The pumpkins were put on paper beside Montjoy Barn to dry; they were picked up as people left the event. The hay ride (large wagon pulled by a tractor) line was near the pumpkin painting. There was a line every time I looked! It was a busy day and the two places I worked were full of people enjoying a fall day. Maybe next year I’ll have time to walk around see more aspects of the festival!